Karen Kunc (pictured above) has been a professor of art at the Univ. of Nebraska since 1983. Recently we came out with a new puzzle with her woodcut image Verse From Macrocosmica (pictured above). Maya: Tell us about the title of this work, Verse From Macrocosmica. Karen Kunc: This title suggests a poetic new language from an imaginary place, that could be anywhere, of the inner imagination or from somewhere in deep space, a new place I have invented. This place name feels interesting on the tongue, and suggests exploration and discovery. Maya: What was the inspiration for this work? Karen Kunc: I was interested in visually describing a song pattern, with graduating circles and graphed repetitions, that create a chart of intensities and tones set against a solid vibrant geometry or structure. So this was an exploration of ephemeral sounds floating, vibrating, with an opposite solidity or building structure of intense fire reds. Maya: Abstract art in the 20th century broke new ground conceptually, but was often not technically very mature. What do you think the state of abstract art is today? Are we still breaking ground conceptually, or is it more about doing it well? Karen Kunc: The state of abstract art today is very healthy, as there is an interest by so many artists yet. But I often feel that the concepts are so much rhetoric that overpowers the visual strengths, so that there is nothing there to look at. Obsessiveness and a formula for make the work predicable – and explainable - seem to gain more attention, while the inexplicable, non-verbal, sensory experience of viewing is not celebrated. Art today has seen the ascendancy of the verbal over the visual. And much of the abstraction is cold, without a personal vision. Maya: Tell us a little about how woodcut art is done? Karen Kunc: The woodcut, or relief printing, is the oldest form of printed art, and has a long history in both Western and Eastern cultures. Images or designs are carved into the surface of a woodblock and then ink is applied onto the relief surface of the block, leaving the carved areas free of ink. Then to take the impression from the wood the ink is transferred onto paper under pressure, usually by hand or by a press. Many kinds of wood can be used, but often artists now use plywood for its size and accessibility. I use birch plywood, and carve with hand tools, and also experiment with scratching, wire brushing, sanding, to create a vocabulary of carved marks. I use two blocks of wood that are carved opposite each other – one has the main forms, while the other has the background. Then I ink up the block with several colors at a time, often through stencils to selected areas, and I create interesting color blending and special effects with the oil base colors. After printing that set of colors for that print run, I then carve the block again, to reduce the areas that take the ink, and then print another run with new color combinations, and layer over the previous colors. This reduction process, or “suicide” method, means that I can never go back, and I use the printing to find my way, evolving the image and the color complexities as I go. Some prints can have as many of 40 – 50 colors done in 8 – 10 different stages. Maya: What artists influenced you? Karen Kunc: I have so many favorite artists whose work I have found influential. Here are a few! Marsden Hartley, Ferdinand Léger, Helen Frankenthaler, Charles Burchfield, Henri Matisse, Jacob Lawrence, Georgia O’Keeffe, Japanese Ukiyo-e prints (e.g. Hokusai). Maya: We took your artwork and ran off and designed a puzzle that we felt "fit" without your feedback - now that you've had a chance to play with our puzzle version of your art, what do you find? Is it what you expected when you licensed your work to a jigsaw puzzle company? Did we do something with your image that fits your vision of this work, or took it off in a new direction? Karen Kunc: The puzzle is beautiful and is much more of an “object” than I expected, with intricately carved edges that are interesting! I think there is a similar visual sensitivity that is called for to work puzzle shapes, that I rely on in my work…..seeking similarities, negative/positive fits, color patterning, and orchestrating of the whole with the parts. I think that making my work is in many ways the working of a puzzle….figure how to do something, what comes next, discerning what the image needs, and sensing the visual cues that the work is sending to me. As an artist I have to respond to this other thing that happens when I set in motion the first steps or choices, which is the art itself. Maya: What's your favorite color (or shape or texture) these days and why? Has that changed much over your time as an artist? 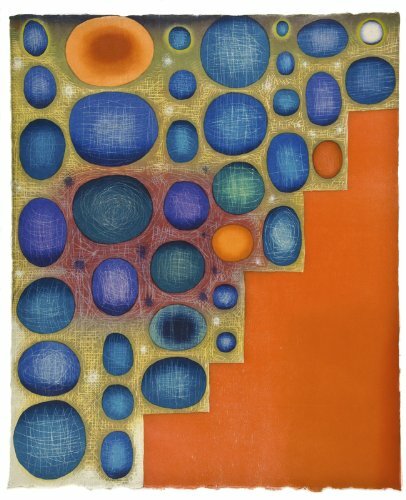 Karen Kunc: I know my current work is filled with lots of circles, ovals, egg-like shapes that all work like focus points, weights, that move in space, or flow, or radiate, and are again offset with geometry and structure. These shapes do things, to the eye, to the sense of motions, to how I direct the composition. Years ago, I used to use more sharp jagged shapes, that looked like raw edges of landscape forms, for a more jarring and clashing edginess. So now I think that I have progressed to these more rounded shapes that balance and rest, and move but still with some strange irregular qualities that surprise and suggested biomorphic processes of growth and decay. My favorite color is that fire red!